Autumn is a season for balancing light and dark, letting go, and accepting the impermanence of things. Autumn is a time of change and often feels bittersweet. We are blessed with the harvest of fresh fruits, root crops and storage vegetables but the days have grown short. We journey inward, into ourselves and into our homes. In Traditional Chinese Medicine (TCM) autumn is a the time of year when the yang energy and warmth of the sun wanes, and the yin energy becomes prominent; Autumn is time to slow down, prepare for winter, strengthening our immune, digestive and respiratory systems. Wear a scarf. Fall is a season associated with the wind. A simple thing like wearing a scarf can ward off cold which in TCM is said to enter most easily at the neck. Breathe Deeply. When we breathe deeply with intention we flood our cells with oxygen with positive affects on energy level, immune system, and memory. Nourish the body and support he immune system by warming up your food. Ease up on cooling meals and transition to roasted vegetables and slow cooked soups and stews. As nature slows down preparing to rest it is good for us to do the same. Go to bed a little earlier and give yourself some extra attention and self-love. Blue Elderberry Elixir: Local wild-crafted blue elderberries, rose hips, organic cinnamon, organic ginger, organic cloves, local raw honey and vanilla bean infused in brandy. Elderberry is an exceptional ally for fighting colds, flu, and respiratory infection. Rose hips provide a boost of vitamin C. Cinnamon, ginger, and clove are warming helping to circulate the goodness throughout your body, and a touch of vanilla and raw honey make this elixir delicious and soothing. Take 2-3 teaspoons as need ed to avoid catching a cold or flu. At the first sign of illness take frequently throughout the day. This elixir can be consumed direcly off the spoon or is wonderful added to a cup of tea. note: throughout history elder has been revered as a magical and sacred plant. Elder hs been used to ward off evil influences, carried for good luck and to protect the home. Ancient legends say a wise woman live in the elder tree to watch over and offer healing. El Diablo: Based on a traditional folk remedy commonly known as 'Fire Cider' or 'Master Tonic', El Diablo supports the immune system, digestion, and respiratory tract. Organic raw apple cider vinegar infused with onions, horseradish, organic ginger, garlic, and organic cayenne. The 2017 version of El Diablo is delicious and gently warming (not too spicy). The onions, garlic, and horseradish were grown in the apothecary garden using organic methods. I like to start my day with a spoonful. El Diablo is tasty drizzled on salad or rice. Salt Creek Elderberry Tisane: Tisanes (herbal teas) are one of the simplest ways to add herbs to your daily routine. Brewing and sipping on tea can be an opportunity to pause and care for yourself. The Salt Creek Elderberry Tisane provides and opportunity to slow down and unwind with a blend of immune boosting and adaptogenic berries, herbs, and roots. Elderberries and rose hips, a traditional cold fighting pair are blended with astragalus, eleuthero, holy basil (tulsi tea), cinnamon , clove, orange peel and hand-cut vanilla bean. Astragalus is known for its ability to strengthen the immune system and energize the body. Astragalus works best if consumed regularly. Eleuthero (Siberian ginseng) and holy basil (tulsi tea) help the body respond to stress, reducing the negative effects on physical and emotional health. Holy basil also has a long history of use for respiratory ailments due to anti-viral, anti-bacterial, decongesting and diaphoretic actions. Cinnamon, ginger, and clove are warming. Citrus peel and vanilla round out the flavor. Steep for a minimum of 10-15 minutes to make delicious cup; however if you require more medicinal strength, let the tea steep for up to two hours. Add honey to taste. Elecampane Beehive: I am very excited to share this year's version of Elecampane honey with you. Elecampane Beehive is a unque and wonderful infused honey. Elecampane has a deep earthy taste which is paired with a local dark and rich buckwheat & alfalfa honey. Elecampane is traditionally used for the respiratory system. Buckwheat honey is dark, thick, and rich in antioxidants. Elecampane is effective at helping to clear up congestion and bronchial ailments particularly those that are productive (wet). Together elecampane root and buckwheat honey combine to make a great remedy for sore throats, and congested coughs. You can eat the honey straight from the spoon or mix in herbal tea or with water. note: Elecampane was considered sacred to the ancient Celts associating it with elfin spirits who were said to seek shelter under Elecampanes's large leaves. Elecampane is sometimes called 'elf wort' or 'elf dock'. Echinacea Simple: A basic herbal extract made by tincturing the roots of organic Echinacea angustifolia with the herb of and blossoms of apothecary grown Echinacea purpurea in organic non-gmo cane alcohol. Echinacea is a staple for cold and flu season. Echinacea works as an immune stimulent and modulator. Echinacea is most effective if taken at the very first onset of cold symptoms (often an itching at the back of the throat). Echinacea is less effective for well-established colds. Take Echinacea Simple early and often at the onset of a cold. I like to combine Echinacea Simple with my elder berry elixir. I also add it to my water bottle bottle with a few slices of ginger and squeeze of lemon. Oregon Grape Digestive Bitters: In Ayurveda, digestion is the number one key to health; The body's metabolic function are directly related to the health of all organs and tissues in the body. Bitter herbs play an important role in healthy digestion by stimulating digestive secretions, improving appetite, alleviating gas, bloating and indigestion. Bitters not only increase the digestibility of foods but can calm the nervous system so that you are emotionally prepared to eat. Mot of us have a dramatic lack of bitterness in our daily diets. Oregon Grape Digestive Bitters are a delicious and complex blend of bitter and flavorful herbs known for their stimulating and nourishing effect on digestion. The Oregon Grape root used in this remedy was mindfully and respectfully harvested from a large patch near Peshastin Creek. Oregon Grape root is intensely bitter and helps maintain healthy liver function and bile production. Fennel, cardamom, ginger, and dandelion root are added to crate a well round bitter. Take 10-30 drops directly on the tongue or in a small amount of water (make sure you can still taste the bitter flavor) 10-15 minutes before a meal. Bitters can also be taken after a meal. 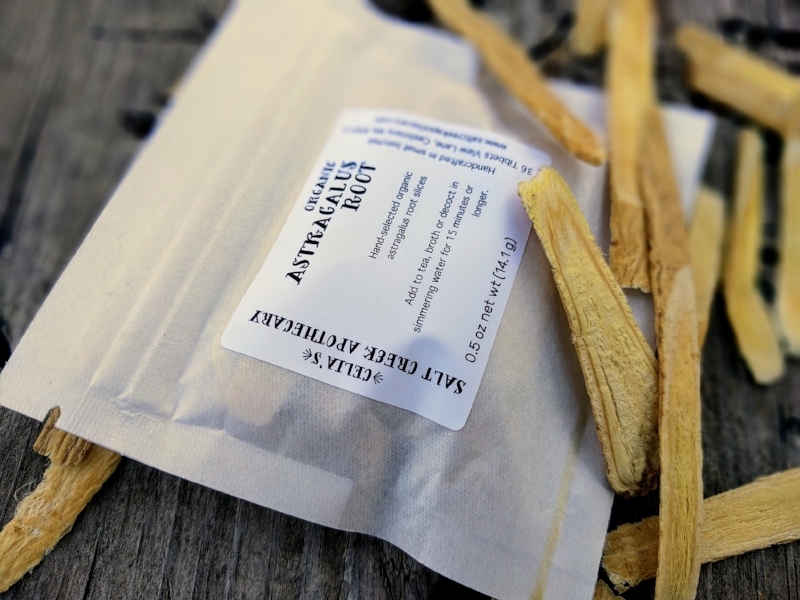 Astragalus Bundles: Astragalus (huang qi) is an herb I rely on during cold and flu season. Astragalus has been used in TCM for thousands of years and is considered one of the most important tonic herbs to help strengthen the body against disease. Astragalus is an adaptogen that helps your body deal with stress, including physical, mental, or emotional stress. Astragalus restores and strengthens the immune response, and pride deep immune system support. if you feel stressed, run down, or a prone to cols you may find astragalus very beneficial. Astragalus is most effetive if incorporated into your daily routine and is best if used over a long period of time for prevention (unlike Echinacea which should not be taken daily but at the onset of colds or flu). Astragalus works best as a decoction (simmered in water). Astragalus has a mild slightly sweet flavor. Add root slices to soups , stews, and while making broth. Astragalus roost slices can be added to tea or coffee. Simmer astragalus root fro at least 15 minutes or up to several hours. Clover Lip Butter: Lip Butter made from red clover blossoms infused in almond oil. The changing weather can be harsh for chapped lips. Red clover softens and nourishes the skin while providing anti-inflammatory effects, reducing pain and redness and providnig soothing moisture. Clver infused almond oil is blended with raw organic cocoa butter and beeswax from local hives. To ensure that the butter is mild and non-irritating, no fragrances or essential oils have been added.